I really like this picture. I just turned 11 recently. I normally draw cats all the time, but I'm ok at horses, too. Hey, that’s really cute but can you show how to do it please? It is REALLY CUTE! It looks like a cute foal mixed into a little pony, and trust me THAT would be cute! If you could draw that, you could draw anything! I managed to draw it, but it would probably be easier with a video. You should start a youtube channel! I am a horse fan and I have a question about the picture, how do you do it? I love ponies so much! Luv ur drawing!!!!!! A picture like that should NEVER be ignored! Keep drawing girl! i love anime drawing and i also draw them too. it's really cool. i love the horse! this drawing was amazing. when i saw the images i loved only this one, so i think u r a good artist. hey that is pretty good but try to draw it by adding details on it. I THOUGHT I WAS THE ONLY ONE WHO DREW MANGA HORSES! OMG! U DRAW EXACTLY LIKE ME! I wanted to draw it, but I couldn't draw it. your horse was so good that couldn't do it! Your pic is sooooooooooooooooo cute! I tried drawing it but yours was better. I draw horses like 10 times a day and yours is better. That's a compliment! Omg omg omg this is the best horse picture I have ever seen! the second I saw this I HAD 2 draw it and I am also 11 cool and I LUV 2 draw!!!!!!!!!! That looks amazing! Me and my friend just HAD to try drawing it! You pic is so amazing! I wish I could draw like that. Amazing pic, I even had a go at drawing it myself. OH MY GOSH THAT'S SO ADORABLE! AWW! cute so cute i traced it..
i think this pic is absolutely amazing. i use to draw stuff like that but i now draw anime wolfs because wolfs are my thing. other than that you're one amazing horse drawer. my cousin will like that cuz she got a horse herself and i'll tell her to comment. OMG!! it's so cute i drew exactly how it looks like. i don't want to show off but i am soooooooo good at drawing. it's so beautiful. i can't make it. you are like artist. i wish i could also make like this but not good than your horse pictures. Your picture is so cute. I wish I could draw like that but of course I am really bad at it. But yet your picture is lovely. You should become an Artist!!! Ok I only just recently drew this and my family thought it looked like this picture, and I thought so to, and the picture is just... just so......... CUTE!!!!!!!!!!! That is so cute. I am going to have a horse or a dog because a horse is gentle but it might too, too big so I might have a dog instead. I just took an animation class last week in camp. I love horses! They are my favorite animals! But, you should also know, I do have trouble drawing them! this picture is so cute! 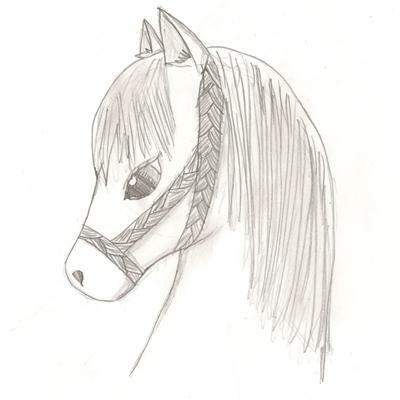 i love horses and ponies and i just drew it! That's a great drawing! I absolutely love to draw too! I am better at manga and anime, but I am trying to get into drawing more life-like animals, instead of make-believe ones. Keep up the good work! I love your Drawing! I can draw horses good but not that good! I would buy it if it was in stores! it could be worth $50.00! I seen better but good job. But please don't think I'm being mean but I can draw better. I think you are verrrry talented. I've seen many horse pics but I have never seen anything like this. I have drawn horses ever since I was 5 yrs old and right now I'm trying to draw this horse so its good. If anyone asks once again you are really good!!!!!!! i love it u have talent so do i. i draw cats a lot too. i would love to see your cats. i cant do a good job by being rushed, it takes me sometime to draw things i draw people and even my art teacher likes them. i love your drawing i even tried to draw it myself. oh cool you have the same talent as me!! Probably 3 out of 50 girls get this talent, just a lucky guess. If I am rushed I make sloppy work but if I take my time I really amaze my friends and others around me. P.S. I would love to see your cats! Manga. if you don't know what manga is, look for it. so cute! =D thats even better than my horse drawings and i specilize in anime. KAWAII!! ow my gourd! i can not draw better than this girl! i love your drawing i've done something similar to that. OMG.......this drawing is so cute u must realy have a talent!!!! This is soooooooo cute! I just love it! If it were for sale i would so buy it! Good job! this is awesome! you r so good at that I wish I could draw like u do!!!!!!!!!!!!!!!!! Anime is a style of art. This is just an anime-style pony. I love horses and cats! I am a big horse fan! But I like cats almost as much and i draw cats too.